On Saturday evening in Fairfax, VA, Jay Lethal became a two-time Ring of Honor World Champion after defeating Dalton Castle, Cody and Matt Taven in a Fatal 4 Way match. 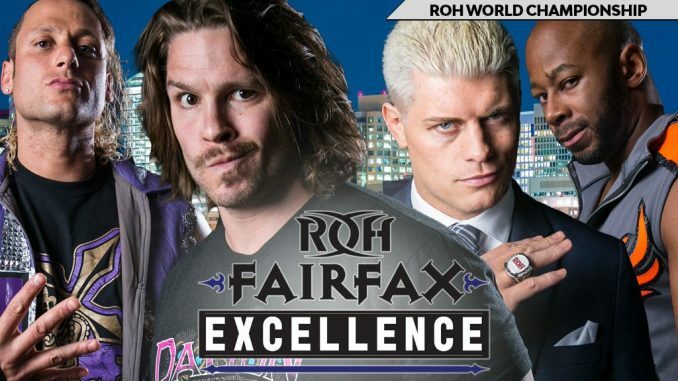 The match took place as part of Ring of Honor’s “Fairfax Excellence” international TV tapings and was streamed live for members of the HonorClub streaming service. The match was announced earlier in the day and follows Castle’s successful title defence against Cody and Marty Scurll less than 24 hours prior at the ROH Best In The World 2018 event. His loss concludes Castle’s 198-day reign as ROH World Champion. Lethal first won the belt over two years ago at ROH Best In The World 2015, a reign that lasted 427 days. He is the fourth man to become two-time ROH World Champion, joining the likes of Austin Aries, Jay Briscoe and Adam Cole. Covering combat sports and pro wrestling since 2005, Wai Ting is a podcaster, videographer, editor and creative director at POST Wrestling. He runs POST Wrestling with John Pollock.